The defining characteristic of a zoom lens is that its focal length can be varied. The focal length determines the angle of view — how much of the scene will be captured — and the magnification —how large individual elements will be. The shorter the focal length, the wider the angle of view and the lower the magnification. The advantage of zoom lenses over lenses with a fixed focal length is that you don’t have to change lenses to achieve a tighter or a wider composition. Most zoom lenses, particularly those designed for consumer and professional photographers, lose focus when the focal length is changed. 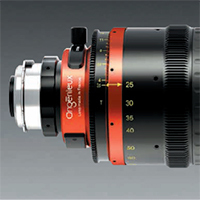 But high-end zoom lenses, especially those designed for producing films or television, can be zoomed in and out without losing focus. This type of lens is called a parfocal lens. The first parfocal lens capable of zooming in an out while maintaining precise focus to a degree acceptable for demanding cinema production was designed and built by Pierre Angénieux in 1956, a feat for which he received an Academy award for technical excellence. Parfocal zoom lenses are very difficult to design and build. Zoom lenses generally consist of three different groups; two of them are moving together (to change focal length) and the last one independently (to focus) and one stationary group of lenses with each group comprising two of more lens elements. With the new method proven, Ayad simulated all of the company’s zoom lenses and found the worst-case position for each lens. Now inspectors are able to inspect the tilt simply by moving the lens to this position and making the measurements. The net result is that the time needed to inspect each lens has been reduced.